Vienna’s bar scene is great and versatile. Cocktail bar, craft beer, lounge or typical Viennese pub? We asked the people in Vienna for their secret tips on extraordinary bars. The result is this post where we recommend the top eight bars we liked best in our tests. Our focus was on the quality of drinks, the furniture as well as a special atmosphere among relaxed guests – away from the classic tourist spots. If you are looking for exciting ideas on how to spend your spare time in Vienna, we’ve got everything you need. Crime Runners is the Live Action Adventure in the city center – Escape the Room in Vienna with three rooms for fans of riddles and adventures. In our Vienna Tourist Guide you will find even more recommendations for the city we live in and love. Have a great stay! Die Parfümerie on Neustiftgasse uses its name from the location that was originally planned for the bar, back when the idea was to open it in a former perfumery. Of course that does not mean the location the three young founders from Vienna actually opened the bar in does not live up to the concept. It has become an oasis for cocktail fans. On the list of drinks you will find classics like Highballs, Moscow Mule, Negroni, and Smashs. The prices are more than fair considering the great quality which makes Die Parfümerie a place where you can go regularly when you don’t want to spend lots of money in exchange for great quality and a young crowd. While the interior might seem simple at first, it’s the details that will make you love the bar for its pleasant and hip atmosphere. Especially noteworthy are small things like the drawings on the toilets, things that make you smirk like condoms on the menu or the exquisite style of the counter that sets a contrast. The founders have succeeded in creating a mixture of consistent atmosphere, high quality drinks and authentic speakeasy style. Be careful not to overlook the location: the bar is hiding behind covered windows. Die Parfümerie opens each night from Tuesday till Saturday at 6pm. You get there with public transport on the lines 5, 13A and 46. This bar has been around for more than 20 years and recently reopened by two well-known bartenders from Vienna. The bar is right on Spittelberg which is known for good food such as in the restaurant Tian and good cocktails as in this bar. The cocktail menu is impressive. With over 100 cocktails ranging from classics like Old Fashioned or New York Sour to the chef’s own modern creations. bestens opens each night at 6pm until 1am and 4am at the weekend. You will reach it most easy by feet from the U3 station Volkstheater. Barfly’s on Esterházygasse calls itself the most famous secret spot in Vienna’s bar scene – and that’s absolutely correct. When you enter the bar for the first time you’ll think about smoking lounges, cigars, champagne, or fancy Victorian outfits. Interior and list of drinks are a perfect match of 1920s style, combined with a great atmosphere of romantic candle light, leather seats, high-quality drinks and wooden tables. The bar that is located in the basement of Fürst Metternich hotel has opened in 1989 and ever since has served its guests classic long drinks and a huge selection of whiskeys and gins. The price range begins at 11 Euro, however fans of classic cocktail culture will never be disappointed by quality. Barfly’s opens each night at 6pm (Sunday at 8pm) until 2am and 4am at the weekend. You will reach it most easy by feet from the U3 station Zieglergasse or Neubaugasse. For many years The Sign has maintained its reputation as a bar of world class quality. It has won many awards, most recently 2015 and 2016, when the bar magazine Mixology named it the best bar in all of Austria. The interior and drinks are high quality and modern. Which is less frightening than it might sound. The atmosphere is relaxed and informal and you’ll meet people who will love great bar culture as much as you do. „Anything but ordinary“ – that is the motto that the concept follows. Which means that manager Kan Zuo himself can be watched working his magic behind the bar and stuns the guests with his extravagant creations. Since the focus is on drinks you will also find matching snacks on the menu. The bar is located close to the station Nussdorfer Straße on line U6 and the tram stop Augasse on lines 33 and D. It opens each night from 6pm until 2am. Another bar that not only impresses its guests but also well-known bar magazines. For many years Hammond Bar has been a place to be for Vienna’s cocktail fans. When you enter the room you’ll see a colourful mixture of dark wood, red walls and gentle shades of green. This gives the bar its urban feel good flair. Nothing seems artificial, nothing overdone. The Zirbenbar downstairs is a curiosity that creates a strong contrast to the modern bar culture upstairs. Many ingredients for many of the individual cocktail creations are manufactured right here and the drinks will not only impress the guests’ taste buds but their eyes as well. The list of drinks depends on the season and changes regularly. Arriving at U2 station Taborstraße you just have to turn around and arrive at the bar after a few steps. Hammond bar opens at weeknights at 5pm and Saturday and Sunday at 7pm. In the interest of its guests the bar nights are open end. Vienna is proud of its beers. If you, however, want more than the standards or are looking for something completely different you’ll feel at home at Craftmühle. The interior is tasteful, yet not at all pungent, and shows that the makers have put a lot of passion in this bar. The bar’s elegant style of wood and glass furniture is completed by great service and an exotic range of hand crafted beer. „100% Craft Beer by friends for friends“ as it says on the website. If you cannot decide from the huge list of beers, you can always ask the service staff for advice. Quality is of highest importance, which also applies to the menu. Matching the selection of beer the kitchen offers hearty burgers. Craftmühle opens daily at 5pm and closes only late at night. You get there by taking the lines U1/U2/U4 to Karlsplatz station. From there it’s only a few minutes by foot. If you want to experience Vienna’s bar scene with the right amount of living room atmosphere you’ll feel at home at Café Liebling. What seems like a building site at first glance is really a well thought-out concept – beginning at the many different suites of furniture, ending at the chair that is stuck in a wall. Café Liebling is known for its charm and cozy atmosphere. As interesting and versatile as the interior is the list of drinks. You’ll find everything that you didn’t know before but always wanted to try – exotic drinks. The specialties of the house change on a regular basis, but it’s guaranteed at any time that anyone can find something they like. As recommendable as the drinks is the broad-ranged menu: with classic and exotic meals. For everyone who likes to sleep in there’s breakfast until 4pm, including a vegan menu. Coming from U3 station Neubaugasse Café Liebling is easy to find. The café opens daily at 9am. Monday to Thursday they close at 2am, Friday and Staurday at 4am and Sunday at midnight. Centrally located in the first district you will find the Kleinod Bar. In 2015, the bar was opened in the historic rooms of the former Galerie Bar, where all of Vienna met for extended celebrations in the 80s. Together with designer Ben Toth, the interior has been designed in a modern style without losing sight of the noble Old Viennese style. In 2017, the bar was honored with the Mixology Award for the Austrian Bar of the Year. On the drinks menu you can find your favorite cocktails traditionally, as well as reinterpreted. With the ingredients, emphasis is placed on quality and detail. Behind the counter, the bar shines with a selection of over 40 gins and international spirits. For long drinks like the Earl Gray Fizz, the bar is supplied by the renowned tea house Demmer. Comfortable leather benches and soft light, as well as a thoughtful drinks menu invite you to sit with friends for a long time and enjoy your drinks in peace. The bar has opened the whole week, from Monday to Saturday from 15.30 to 4.00 o’clock, as well as Sunday from 17.00 to 2.00 o’clock. You can reach the bar by foot from the U1 / U3 station Stephansplatz. Finally, there’s an insider tip that many people don’t know due to its location. Instead of directly in the city it’s found a little north of the station Ottakring. With its open and modern wooden interior the bar is loved for extravagant drinks with even more extravagant names. This is why you’ll find drinks called Super Storm Trooper, Fish Soup or Pai Mei. As quirky as the names of the drinks, as high-quality are their ingredients. Also those who like to stick with what they know will find something they like at Bei mir. The list offers classics like Mai Tai, Gimlets and Gin Tonics. 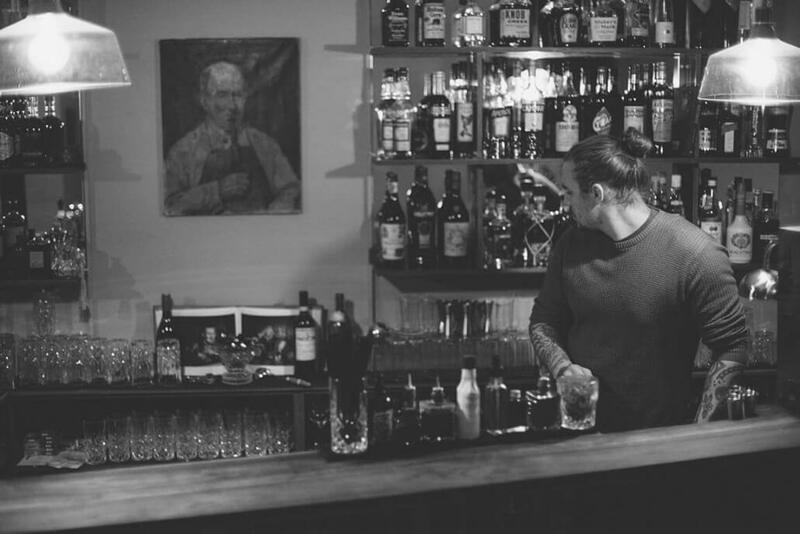 By opening the location, manager Matthias Habringer fulfilled his dream of his own cozy bar. A dream many people share. Bei mir opens Monday till Saturday from 7pm to 1am, at the weekends till 2am. You find it about 10 minutes by foot from the station Ottakring or around the corner from line 44 station Wilheminenstraße / Wattgasse. We hope that our cool bar recommendations in Vienna have made you want to take a look at some of these locations. And if you enjoy trying new things, why not visit one of our three Escape Rooms close to Schottentor. Here you and your friends can experience an adventurous riddle full of adrenaline.